Deepavali just got over and I can't believe the next festival is almost here! Thiru Karthikai ! Deepavali and Karthikai have way different stories of origin according to Hindu Mythology but both the festivals are similar in two main aspects. Festivals of lamps and light. 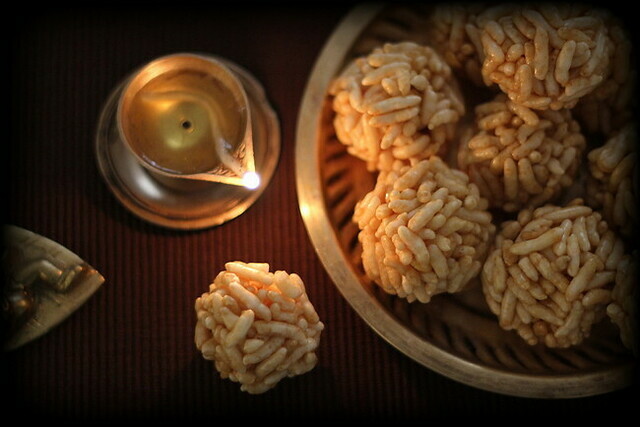 Festivals of fresh sweets. 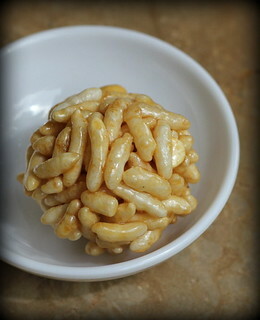 Many sweets are associated with Karthikai, most of them being simple to make and kid friendly. I used to make 'Pori Urundai' when my kids were really small. I cannot call them 'urundai'/ balls because I never took the trouble of rolling them out to pretty looking shiny balls. After the mixing part I used to dump the sweetened puffs coated with sugar syrup on a flat ghee smeared tray and broke into shapeless squares or triangles or pentagons after the mass got cooled. Anyways the not-so beautiful looking 'chikkis' vanished within seconds. Believe me, this is my first attempt in shaping them into balls. I used jaggery instead of sugar to make it flavourful and tastier. 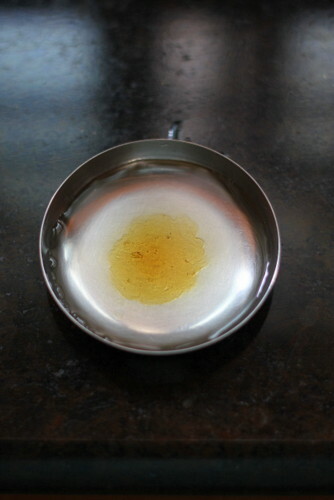 Transfer crushed jaggery to a pan with the measured water. 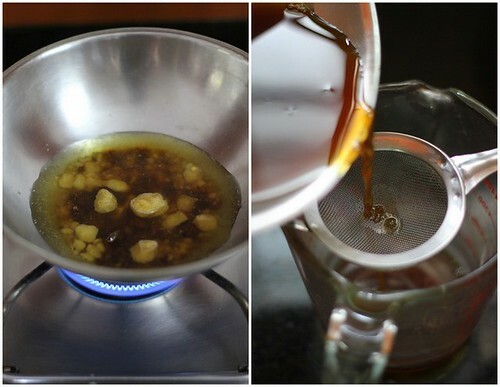 Boil the filtered syrup, keeping the flame low after it begins to simmer, until it thickens a bit . When it reaches the consistency of honey, stir along cardamom powder and be very careful with the next stage as it is our required consistency. 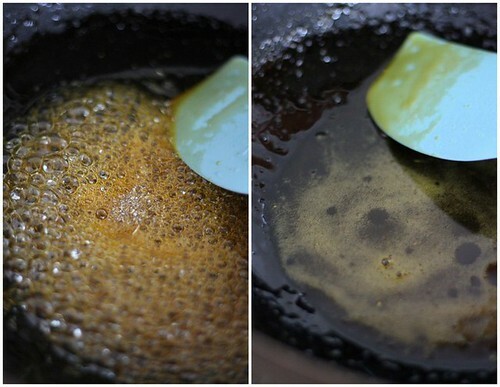 I prefer to boil the syrup in a non- stick pan as it helps much towards the later stages. When the syrup has the consistency of honey, it doesn't dissolve if dripped on to a small plate with water. And you can notice it settles to the bottom, though it spreads and flattens a little. This stage is attained within seconds of the previous. So be very careful. If you use the measurement of jaggery, I'd used, it's better if you switch off the stove as the heat of the pan would be enough to bring the syrup to the required consistency. The syrup is slighter thicker than the previous stage, holds the shape if dripped into water and you may gather and roll to a not so soft-not too hard ball with your finger tips. 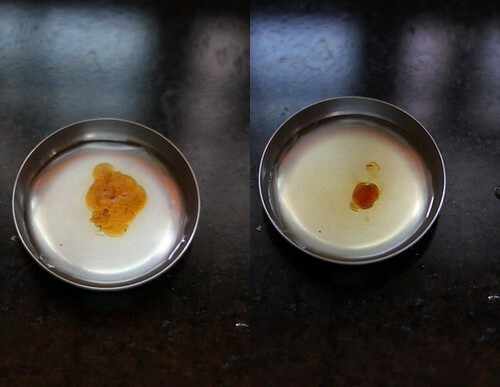 If you are first timer, do not waste your time rolling the ball with the syrup back on fire coz the syrup may harden further and you will not be able to roll the balls. 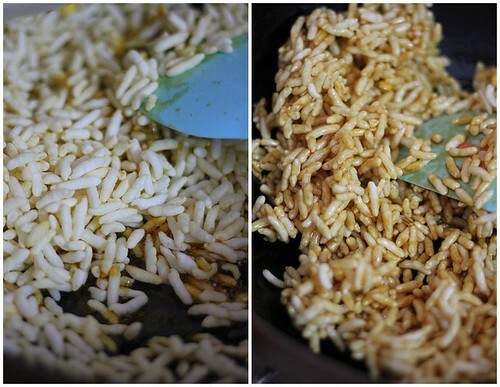 Dump the puffed rice to the hot syrup in the pan and stir gently to combine. The syrup should be coated evenly on the rice puffs. Smear your finger tips liberally with ghee and gather the sticky puffs slowly while the mixture in the pan is bearably hot. The puffs fall apart if it's too hot, so don't panic :). 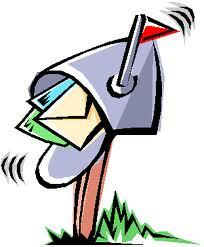 Do it gently, with your finger tips until you see them shaping up. While you roll out, you will see that the syrup binding the puffs hardens as the mass cools down. You may return the unshaped mix to the non-stick kadai and warm this up stirring gently all the while over minimum fire.This will loosen the whole mass and you may repeat the process until done! The balls harden when they are cooled in room temperature. Store in airtight containers. Very festive and nice explanation on the syrup consistency!!! First line of your post and my today's post is almost same dear :-) First picture with blur effect looks really good. I like this more when using Jaggery. 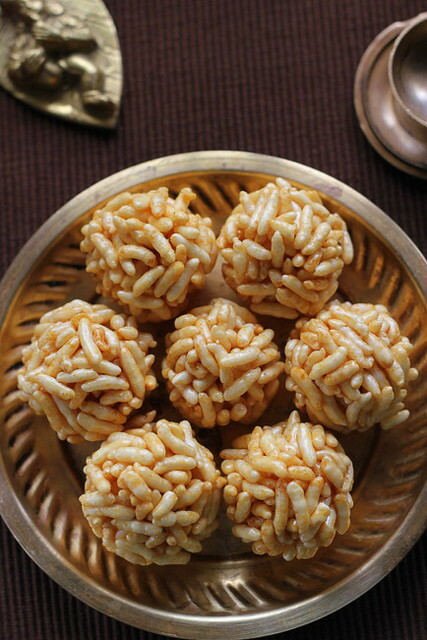 Karthigai deepam wishes, who can resist to this perfectly rolled puffed rice balls. Happy Karthigai, Bharathy! I use rice flour to dust my hands and work surface instead of ghee (counting calories, you see). This also helps me with bearing the hot sticky mess on my hands :) The clicks are great as usual and the pori-urundai looks yummy. However, how come you made this with arisi pori (the snack variety) instead of the nellu/arisi pori you get specifically for the traditional pori-urundais? Nothing wrong with it, but, just wondering if you do not get them anymore back home. I some times make these with molasses since it is easier to find in the groceries here in the UK, than jaggery, and it makes softer but pretty similar pori-urundais. Hope you have a wonderful time on Karthigai. 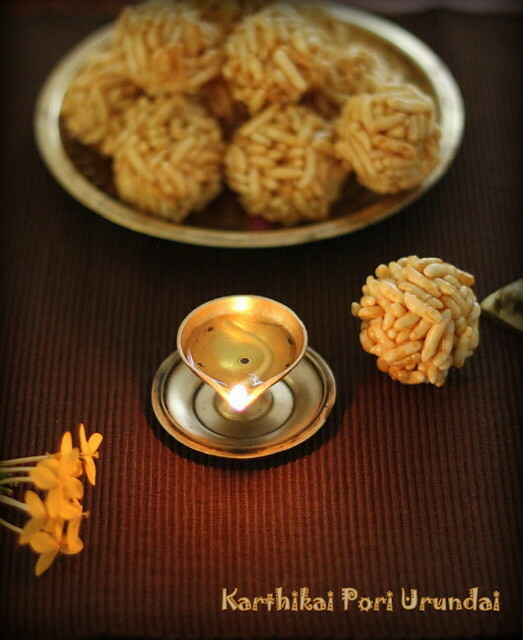 Happy karthigai deepam wishes... very good clicks.. I love the first one. i loved the first click Great with flowers ! 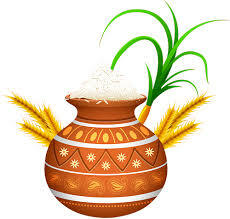 Happy Karthikai...Festivals make us miss those who are not with us all the more... These are my favourite, always had store bought ones...we also get sev laddus which should be similar procedure substituting sev for pori....now I know how to make it... will try it. Brings back memories of childhood days when the street vendor brings these to our house and even before my mother has paid for it, I would be crunching the big sweet pori urundai. How about kadalai urandai that accompanies this? Nice pictures and color combination. Very nostalgic! I will make some when I get the pori for it. One relative of mine makes these. We call them "moori ke laddoo". She makes it so awesome and brings them for all of us whenever we are home. Love these. 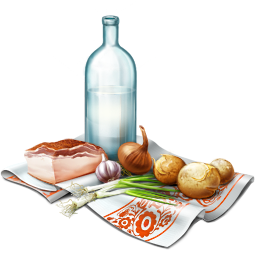 Light and tasty snack.